I'm Denise Cline, owner of The Minky Boutique. 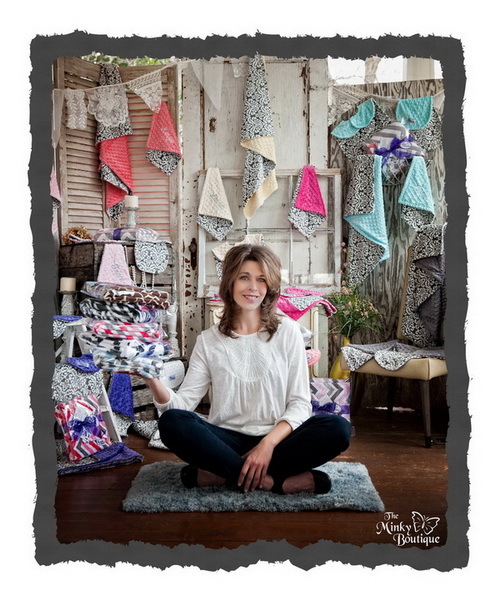 As a single mom of three, I began the business 6 years ago as an online fabric store specializing in a luxuriously soft, micro fiber fabric called Minky Cuddle. With over 350 top quality Minky Cuddle fabrics to choose from, we offer one of the largest online selections. We currently stock over 70 colors in our Minky Dot and Smooth solids, making us a favored fabric shop for sewers and quilters all over the United States. As a lifelong sewer from the age of 9, I also offered custom blankets from the fabrics sold in my shop. From that, the "Homespun Elegance" line was born. Homespun Elegance is a completely handcrafted line of baby products. All of our products are produced in our local shop in Concord, NC by me and my team of incredible ladies who have over 100 years combined sewing experience. We are committed to keeping our product produced under tight quality control by talented artisans in our local area. Every item is cut, sewn and packaged by hand making this the perfect gift for your loved ones, family and friends. Our handcrafted products are vintage quality reminiscent of the days of yesteryear with durability second to none. The Homespun Elegance line was recently shocased in a commercial for PayPal and featured on the local series, "Made In North Carolina". Our luxuriously soft blankets, crafted with great pride and love, will be your loved one's favorite for years to come. Let us help you create that special, unique, handcrafted gift today for the special people in your life!